Police, Prison, Treasuries, Industries and Commerce, NCC, Stationery, and Printing Department, Survey and Land Records, Labour, Police, Prison, Treasuries, Industries and Commerce, NCC, Stationery, and Printing Department, Survey and Land Records, Labour, Fisheries, Employment ana Training Department, Highways department and other departments). 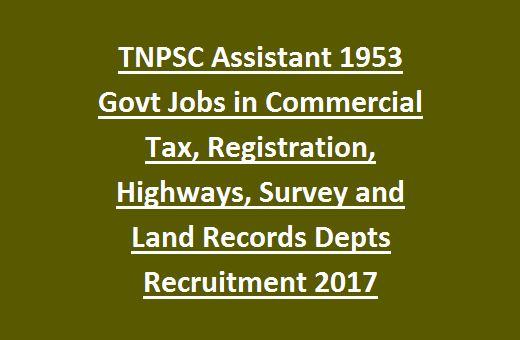 There are total 1953 vacancies available in this TNPSC Assistant Jobs recruitment 2017. Interested/ Eligible candidates are suggested to apply online on or before 26/05/2017. Online applications will be received from 27-04-2017 through the official website of TNPSC of Tamil Nadu @ www.tnpsc.gov.in. Selection of Assistant vacancies of TNPSC recruitment will be held based on written test. See the below given details for Available vacancies, pay Scale, Age limits, Educational qualifications and selection process for TNPSC Assistant Jobs recruitment notification 2017 TN Ministerial Services. Click here to see the official notice of Tamil Nadu PSC Assistant Jobs Recruitment. Starting date to submit online applications: 27-04-2017. Closing date to submit online applications: 26-05-2017. Last date for fee deposition through Bank (SBI/ Indian bank): 29-05-2017. Written Exam date: 06-08-2017 (10.00 AM to 01.00 PM). Vacancies available in TNPSC: 1953 posts. See the official notification for vacancy wise details. Assistant Jobs Department wise vacany details are given below. For Finance Department Assistant jobs candidate must have qualified degree in Commerce or Economics or Statistics. Candidate should have minimum age of 18 years and maximum age limit is 30 years as on 01- 07- 2017. See the TNPSC notification for maximum age limit details. Selection for this Tamil Nadu TNPSC Assistant Jobs recruitment will be held based on candidate performance in written test only. Objective type multiple choice written exam will be conducted for 300 marks. Minimum qualification is 90 marks. Exam duration is 3 hours. Syllabus will be covered from the below given topics. 3. General Tamil/General English SSLC-100 Questions will be asked for this section. Each question carries 1.5 marks. Examination fee for the candidates who are not eligible for concession is Rs. 150/- plus Registration fee is Rs. 100/-. Applicants who have already registered in OTR (One time registration) system paying of Rs. 50/- are exempted to pay registration fee. Candidates eligible for Concession of Examination fee are listed in TNPSC official notification. Eligible candidates can apply online applications through the official website of TNPSC @www.tnpsc.gov.in. Read the user instructions before filling the application through online. Last date to submit online application is on or before 26- April- 2017. Click here to apply online for the TNPSC Assistant Jobs Recruitment 2017. 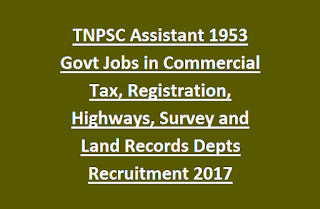 Please share this Tamil Nadu TNPSC Assistant Jobs Recruitment Exam 2017 article to your friends via social pub sites such as Face book, Google Plus and Twitter.